What I like a lot! One of her Gift Vouchers will do! 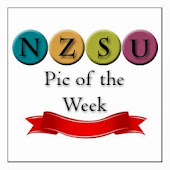 I do hope you all have a great Christmas & New Year & will catch you all in 2010 with inspiration & ideas from the very talented demonstrators & friends of NZSU. 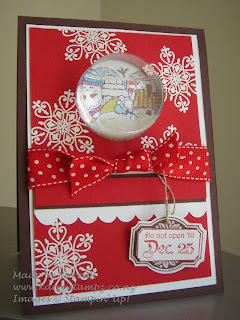 Jenny is this week's inspiration with her 12 days of Christmas gifts. 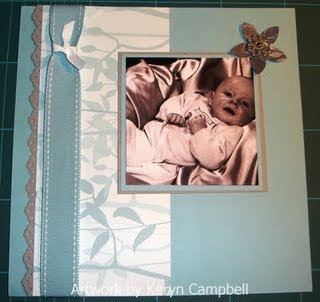 She has some cool projects but I love her bit late fold out-scrapbook - especially as I'm a bit late with posting this as my sister has been working on my PC lately. 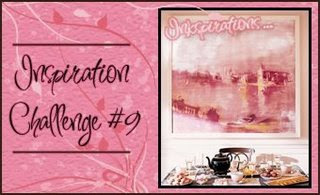 So this week's challenge is to link below your gift ideas. 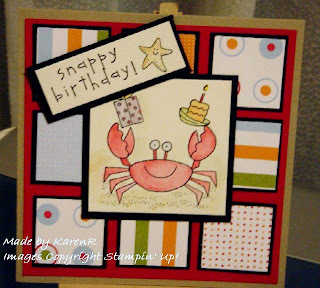 Well I hate to say this but I haven't been able to find anyone this week that has shared or linked to somewhere else or provided a tutorial apart from ME and my link to the snow globe video - so I'm going to nominate myself for this week's inspiration - my card for my downline was cased from one of my favourite Aussie bloggers Kirsty Brown & she has done something amazing today with the sweet treat cups & butterflies - stunning! So this week's challenge is to link all those ideas for Sweet Treat Cups; which should be easy as I can see there's plenty appearing already. is this week's inspiration - she's got a real web page & it doesn't link with blogger so she sits on the RHS all by her lonesome - but do check her out - she has some really cool projects to see. 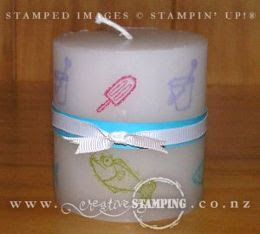 I just adored this stamped candle using Just Beachy which after tomorrow will no longer be available from your SU! Demonstrator as the Spring Mini is making way for the new Summer Mini on December 1st. 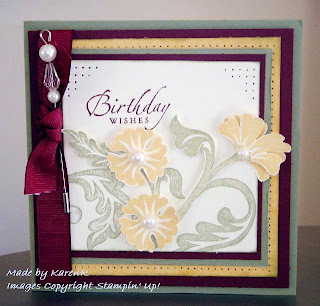 So this week's challenge is to post a picture of your candles, if you don't know how to stamp on a candle check out the tutorial on Split Coast stampers HERE. My only advice is to look out for nice white candles - there seems to be yellowish ones at a lot of the $2 shops/TWH lately. 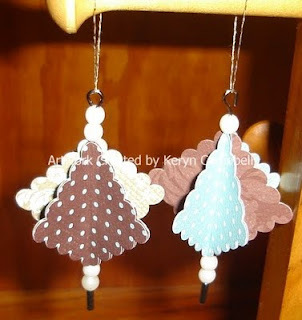 It was a toss this week between Rachael Knight's & Keryn Campbell's lovely ornaments but as there's no rules here let's have BOTH for inspiration! 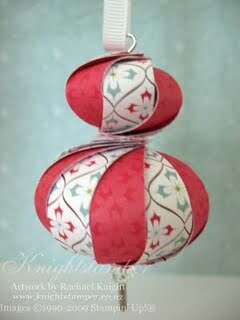 So any Christmas ornament made using designer series paper is the challenge this week. 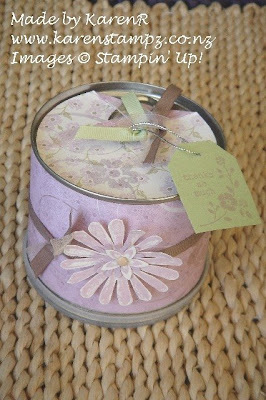 Debbie is this week's inspiration - she's made some really cute triangle boxes & has really clear instructions on how to create them - so hope you can join in this week as these are easy too. Cut off for entries next Sunday at 9.00pm. 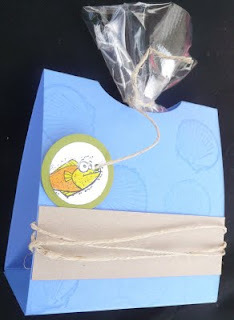 Donna is this week's inspiration with her Just Beachy wee treat bag holder, it will be hard to top hers but let's all have a go - cut off next Sunday at 9.30pm - giving us all week & the weekend. She has a link on her blog to the tutorial on how to create it. Again you can link to Mr Linky using a public site like SCS or PCP if you don't have a blog. If you havn't already heard of U Stamp - where have you been? 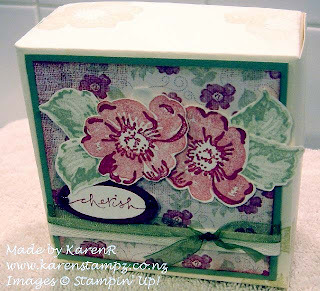 Now in New Zealand 3 fab demos Cherie, Michelle & Sharlene, all Naki girls, have gotten together to create We Stamp. 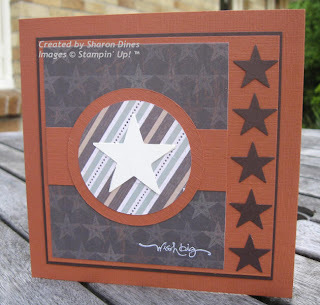 You can join We Stamp for a small fee and recieve heaps of layouts, ideas, projects etc... For more info on what it's all about you can visit the We Stamp site. They've also currently got a challenge going - Clean & Simple. 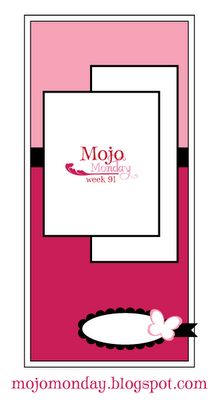 Have a go and check out what the girls have got for you! 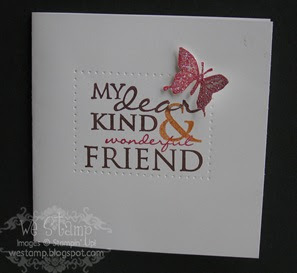 Makeesha is an extremely talented, and sweet, Aussie Demo who regularly has Inkspiration Challenges on her Blog. Unfortunately I can't add her link to the Challenges link roll because she's already under the Aussie one and that would just mess things up for some reason. So here is her latest challenge. 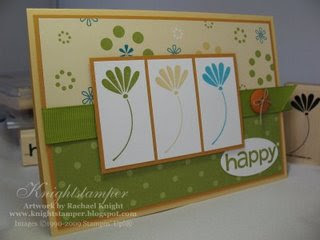 I was filling in 10 minutes before I head out in the rain for some stamping with the m&m's and I came across this on Splitcoast. 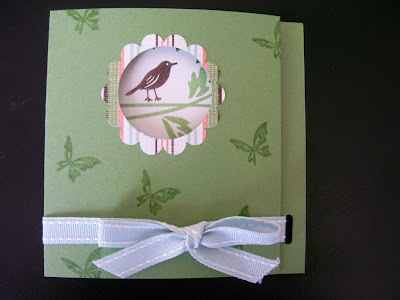 There are three pages full of ideas on different ways of using the punches Word Window, Round Tab and Ovals. Follow this link to take you there. Here's the update, although some of the web host places I checked out looked good. 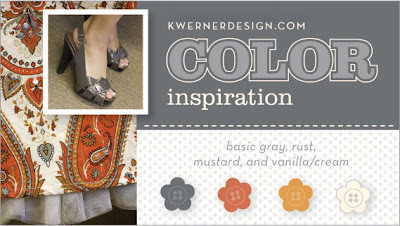 I couldn't find one that would have anything similar to the blog roll. And since the blog roll is the main feature here we definitely don't want to lose that. So for now the blog will remain as it is, with the odd change/addition every now and then. This blog is getting rather big and I was thinking it may be easier for me and everyone else if I changed it over to a web page rather than a blog. Unfortunately I know nothing about running web pages and the only one I've really looked at is on my Mac using Mobile Me which cost $150/year. Keep an eye out I may use their free trial and you can have a look at how it would look and work over the weekend. I would really appreciate feedback on what you think. 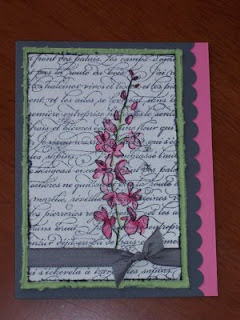 Here's Jenny's Cami card. I really like how she's stamped the bird showing through. And I so wish I'd ordered the Afternoon Tea DSP. 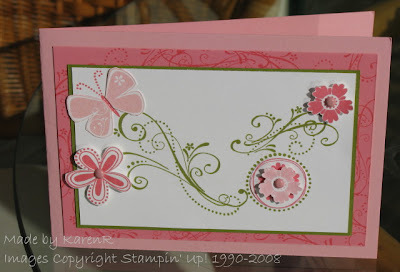 You can visit Jenny's blog Stampin by the Seat of My Pants. 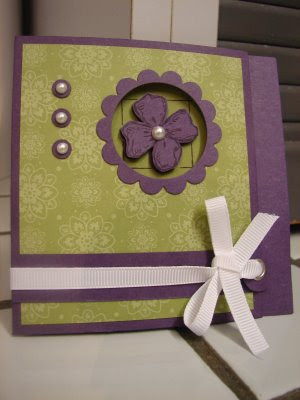 Here's a very sweet card, I'm sure destined for a very sweet girl. 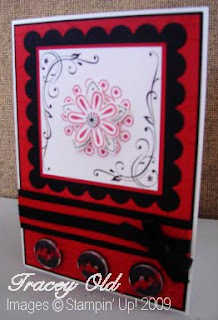 Lisa's made this card using this months challenge, and like Tracey's card has taken me a few days to get it posted. 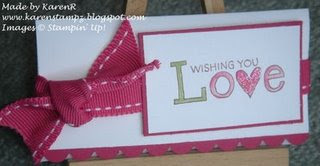 You can visit Lisa's Blog by clicking this link. I'm a bit slow getting this card posted, sorry. 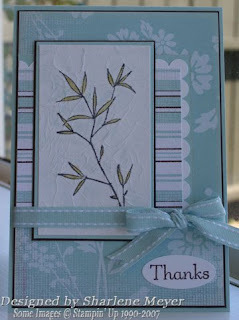 Tracey emailed me a few days ago with a pic of ths gorgeous card. Loving the colour combo. She's used the cami tri fold. 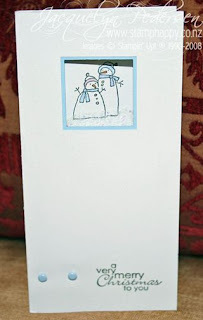 You can see what else Tracey's been up to on her Blog. It's been a while since we had an Inspiration post. 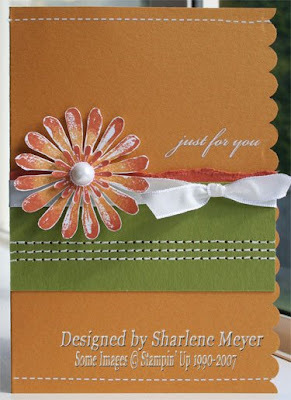 I love what Sharlene has been doing with Faux Silk technique. 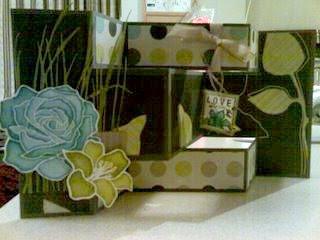 I must admit the first time I tried this technique, I used real tissues and not tissue paper, don't know what that technique would be called! 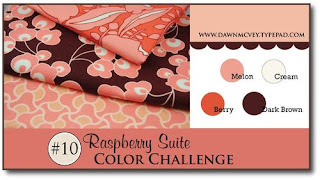 Here's the link to the Splitcoast Faux Silk Tutorial and here's the link to Sharlene's blog. Oops, I'm so sorry everyone. With getting organised for school and swimming and everything going on I completely forgot about the blog candy which was supposed to be drawn last Saturday. The winners thanks to my random number picker, aka - Baylee, the winners are Delys and Megan. So Delys can you please email me at nzsublog@xtra.co.nz your postal address and I'll get your blog candy out to you in the next few days. 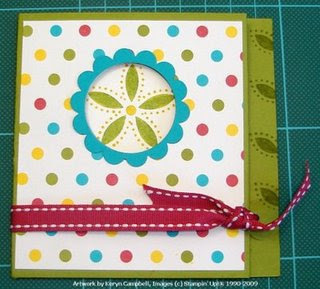 Keryn's made this lovely bright coloured card. To see the inside visit her blog HERE. 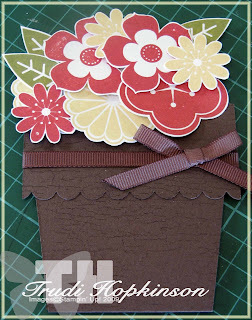 Karen used the Colour Challenge when making this cute treat holder. 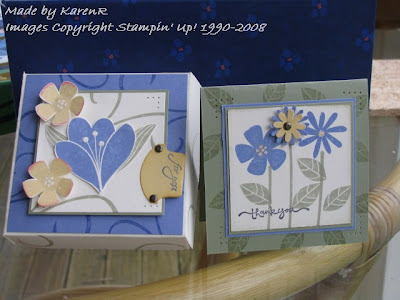 You can see the rest of them on Karen's Blog including instructions. I wanted to quickly post this before I went of to swimming lessons with Bella. 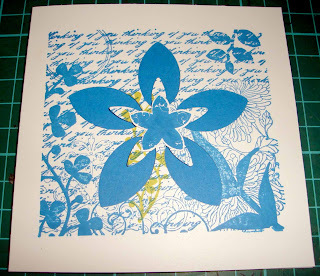 Lisa Has made a card using the current colour challenge. The paper piecing is very cool. You can visit Lisa's Blog HERE. Tracy's always good at getting challenges in. 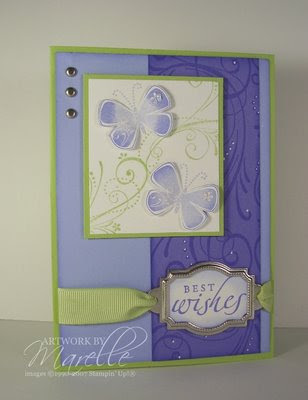 I love this one, it uses a very popular set, one of my favourites and the very first SU set I ever brought! 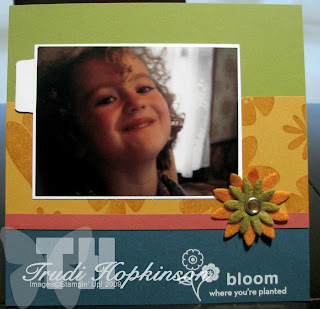 Visit Tracy's blog HERE.